Risk [electronic resource]. 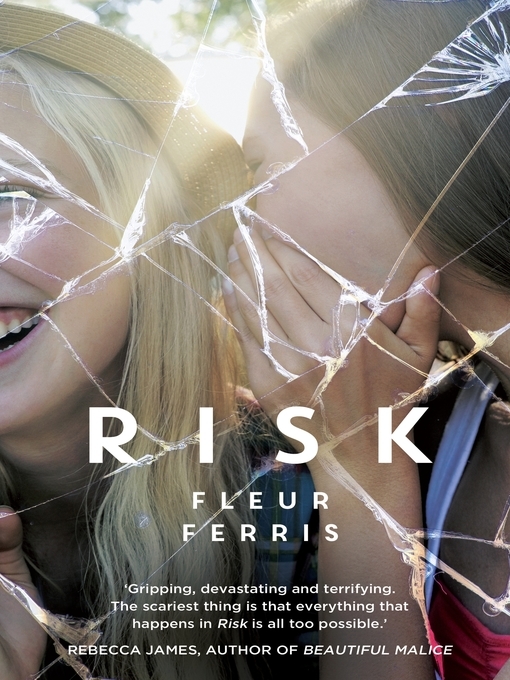 Fleur Ferris. Material type: BookPublisher: North Sydney : RHA eBooks Child, 2015Description: 1 online resource.ISBN: 9780857986481 (electronic bk).Subject(s): Young Adult FictionGenre/Form: Electronic books.Online resources: Click to access digital title. | Excerpt Sample | Image Large cover image | Thumbnail Thumbnail cover image Summary: 'Gripping, devastating and terrifying. The scariest thing is that everything that happens in Risk is all too possible.' Rebecca James, bestselling author of Beautiful Malice Taylor and Sierra have been best friends for their whole lives. But Taylor's fed up. Why does Sierra always get what - and who - she wants? From kissing Taylor's crush to stealing the guy they both met online for herself, Sierra doesn't seem to notice when she hurts her friends. So when Sierra says Jacob Jones is the one and asks her friends to cover for her while she goes to meet him for the first time, Taylor rolls her eyes. But Sierra doesn't come back when she said she would. One day. Two days. Three . . . What if Taylor's worrying for nothing? What if Sierra's just being Sierra, forgetting about everyone else to spend time with her new guy? When Taylor finally tells Sierra's mum that her daughter is missing, Taylor and her friends are thrown into a dark world they never even knew existed. Can Taylor find Sierra's abductor in time? Or should she be looking for a killer? When a former police officer and paramedic writes a novel inspired by true stories of online predators and love gone wrong, you know you're getting the real deal. 'Gripping, devastating and terrifying. The scariest thing is that everything that happens in Risk is all too possible.' Rebecca James, bestselling author of Beautiful Malice Taylor and Sierra have been best friends for their whole lives. But Taylor's fed up. Why does Sierra always get what - and who - she wants? From kissing Taylor's crush to stealing the guy they both met online for herself, Sierra doesn't seem to notice when she hurts her friends. So when Sierra says Jacob Jones is the one and asks her friends to cover for her while she goes to meet him for the first time, Taylor rolls her eyes. But Sierra doesn't come back when she said she would. One day. Two days. Three . . . What if Taylor's worrying for nothing? What if Sierra's just being Sierra, forgetting about everyone else to spend time with her new guy? When Taylor finally tells Sierra's mum that her daughter is missing, Taylor and her friends are thrown into a dark world they never even knew existed. Can Taylor find Sierra's abductor in time? Or should she be looking for a killer? When a former police officer and paramedic writes a novel inspired by true stories of online predators and love gone wrong, you know you're getting the real deal.